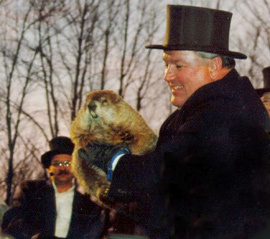 For Groundhog Day officials, formal attire is recommended. Photo Courtesy of Scary Squirrel Website. Groundhog Day, February 2, is an unusual holiday. It is really more of a tradition than a day that people celebrate. A groundhog is a small wild mammal that lives in burrows. Legend has it that if a hibernating groundhog comes out of its burrow on February 2 and sees its shadow, it means that there will be six more weeks of winter weather. So, the groundhog retreats back to its burrow to wait for spring. However, if February 2 is a cloudy day and the groundhog casts no shadow, then it means that spring will come early and the groundhog remains above ground. The small town of Punxsutawney in Pennsylvania is the center of attention on Groundhog Day. Records have been kept since 1887 on whether or not the town’s “official” groundhog, Punxsutawney Phil, saw its shadow on February 2. There have been countless “Phil’s” over the years, as the life span of a groundhog is relatively short. Phil often appears on national television on February 2 to give his forecast. Phil even met President Reagan in 1986 and appeared on the Oprah Winfrey Show in 1995. Each year tens of thousands of people descend on Punxsutawny on February 2nd to see what Phil will do.